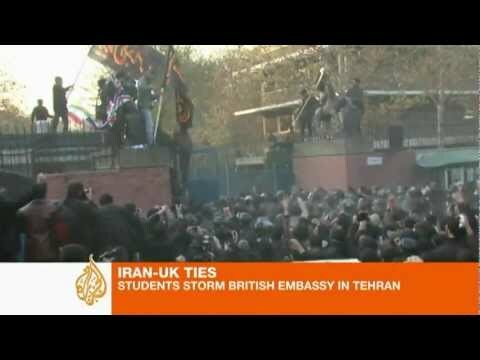 Persons portraying themselves as angry Iranian students occupied the yard and foyer of the British embassy in Tehran on Tuesday, as well as a smaller facility where six embassy employees appear briefly to have been taken hostage. The militant students (or possibly members of the Basij paramilitary) were protesting increased British financial sanctions on Iran, and Robin Pomeroy of Reuters suggests that they may have been supporting rightwingers in parliament against President Mahmoud Ahmadinejad. Parliamentarians are pressuring Ahmadinejad to close the British embassy, but he has been reluctant to take that step. Despite the cartoonish caricatures of Ahmadinejad in the US press, the president was revealed by wikileaks US cables to be more interested in compromise with the West and more open to decreased censorship than regime hardliners such as the leadership of the Iranian Revolutionary Guards Corps. An important context for this attack on the British embassy is a conspiracy theory mindset in Iran that blames the British for virtually everything that goes wrong in Iran. This theme in popular politics got started in the 19th century, when the British actually did intervene in Iran quite a lot (having regional interests because of British India, British clients in the Gulf, and petroleum, plus their rivalry with the Russian Empire to the north, which was often played out in Iran and Afghanistan). Why exactly the conspiracy theory survives at a time when Britain is no longer an imperial power would be hard to explain. I backpacked around Iran decades ago and people frequently volunteered to me then that Britain was behind this or that development. So those who attacked the British embassy did so in part because they believe that it is a counter-revolutionary espionage center dedicated to overthrowing the Islamic Republic and returning Iran to the status of a semi-colony. They read the new British financial sanctions in that light. It is true that British governments have often had rocky relations with the Islamic Republic since it was established in 1979, and it is also true that BP would love to get back into Iran and develop its petroleum and gas fields, which is only going to happen if the regime is overthrown. But Britain doesn’t have the assets in the country to attempt a full-blown counter-revolution, and it has been negotiating with Iran for years, so the full Conspiracy is not actually believable. I’ve seen two arguments about the attack. One is that the attackers were Basij, not militant students, and that they were ordered to carry out this action by someone in the Iranian government. This scenario is entirely possible. But it is also possible that militant students spearheaded the embassy invasion for their own purposes. Being a pro-regime militant student leader is after all a career path in revolutionary Iran. One big question: If the regime was behind it, why have police teargas them and try to break the rally up? Either way, that hardliners of some description are pushing for the expulsion of the British ambassador seems clear. That such a step would not actually benefit Iran is also clear. As it is, some international forces are attempting to isolate that country and turn it into North Korea. The hardliners would be foolish to abet that process.